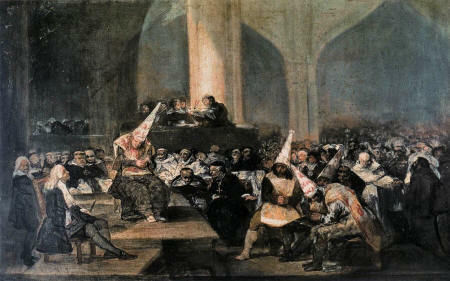 as illustrated by Francisco de Goya. It’s a loaded question which, needless to say, provoked a lively debate on the nature of religion as a force for oppression and negativity in the world today. It’s not hard to see why so many people think this way – religious wars and persecution have, over the centuries, killed untold millions; the tenets of Holy scriptures used as a justification for a litany of crimes against humanity, from the Crusades in the Near East and the conquest of the New World and subsequent genocide of the indigenous population, to the horrific Inquisition and the frequent slaughter of heathens “in the name of our lord Jesus Christ”. Today, religious institutions continue to come under intense criticism, often completely justified, as is the case with the ongoing scandals of child abuse and corruption or encouragement of violent extremism (something fundamentalist Christians are as guilty of as their fundamentalist Islamic counterparts). Judaism, too, is often deliberately equated with Zionism, in order to absolve the state of Israel any culpability for its crimes against humanity committed against the Palestinian people and other Arab neighbors. The considerable atheist backlash against religious organizations and their impact on the development of the species is understandable – and yet, ironically, sometimes these reactions betray another type of close-minded dogmatism, one which seeks to deny that religion has any form of value whatsoever and should be entirely discarded in favor of a new ideology; a kind of “militant atheism” whose adherents set out to attack religion whilst propagating their own perceived certainties. It is an irony which is perhaps best summed up by the foundation of the first “atheist church” in London earlier this year; while calls to stamp out religion altogether resound with Evangelical zeal. A legitimate response to the view that religion is a destructive force in the world is that the institution has perverted decent and right-thinking tenets for its own nefarious ends; that Holy scriptures intended to enlighten and liberate have become warped into dogma and orthodoxy – tools of control to manipulate the masses. The ambiguous nature of these texts – the allegories and parables loaded with hidden meaning and symbolism – are, by their nature, open to misinterpretation and abuse. But while this may be true, to suggest that this quality makes them somehow inherently flawed on account of their institutional manipulation and therefore ultimately worthless is to throw the baby out with the bathwater. Christianity, for instance, has a rich and diverse history which denies simplistic characterization. Compare the Christian Gnostics or Neoplatonists with the early Roman Christians where Greco-Roman pantheism still played a role, to the Catholic church and the huge schisms of the Protestant Reformation, and it is clear how impossible it is to define Christianity as any one thing. There are probably more Christian denominations scattered around the globe today than at any other point in history, with an influence as equally varied. Few would deny that the current economic system is one of the most destructive forces in the world today, exacerbating poverty as the divide between rich and poor continues to grow exponentially. Loans made with excessive and abusive interest rates plunge millions into debt, an immoral practice known as usury. All the main religions, from Judaism and Christianity to Islam and Buddhism, have condemned this practice, with numerous references found throughout the Hebrew Bible, New Testament, Qur’an and even the ancient Indian Vedas. Few would disagree that the world would be a significantly better place without the unscrupulous practices of modern day moneylenders. “men forgot that All deities reside in the human breast” and sought equality and liberty for all. 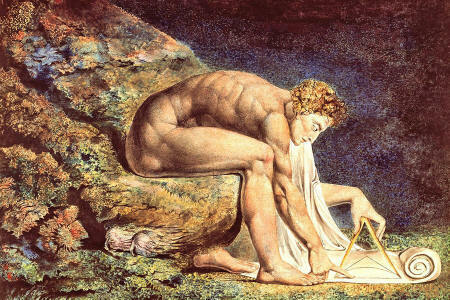 Heavily influenced by the Gnostics, Blake has been described by some as a visionary anarchist. Other historical religious groups have spearheaded radical political movements: the 17th century Diggers were a group of Protestants who sought to reform the social order and create a system of small rural communities based on egalitarian principles – they were to influence the San Francisco Diggers of the 1960s, the community anarchists and radical activists of Haight-Ashbury. Their influence was felt again in the revival of anarchism and the anti-road movements in the UK in 2011. Russian writer Leo Tolstoy’s views on anarchism were pacified by his devotion to Christianity. “The Anarchists are right in everything; in the negation of the existing order and in the assertion that, without Authority there could not be worse violence than that of Authority under existing conditions. William Blake is one who recognized how the profound spiritual truths of religious texts were sunk into obscurity by the institution of the Church. He condemned the sophistry of theological thought, which endorsed individual repression where “sin” bound men’s desires, while at the same time excusing acts of evil and injustice. These criticisms still stand today, not least in the manner in which religious institutions often deny that any kind of spiritual understanding can come from within. The Gnostics and many others were persecuted by the Roman Catholic Church after the Council of Nicea in 325, and the Church ended up becoming self-proclaimed arbiters of “spiritual enlightenment” whereby the average person could only encounter the divine through the medium of the priest. The pulpit often stands as an emblem for the spreading of dogmatic ignorance in the form of false wisdoms, subverting Christ’s teachings with skillful sophistry to protect its own wealth and authority. As the mainstream monotheistic religious institutions continued to dominate and expand their global influence, “dissenting” groups such as the Gnostics were forced underground where they would become part of a rich Western tradition of esoteric wisdom and hidden knowledge, incorporating the occult teachings of the ages, from Hermeticism and the Kabbalah through to alchemy and the Rosicrucian Enlightenment. “not the first of the age of reason, he was the last of the magicians”. As well as being a practicing alchemist, he believed he was specially chosen by God for the task of understanding Biblical scripture. These characteristics certainly cast a new light on a man who is often thought of as the archetypal materialist scientist. Newton ushered in an era dominated by the mechanistic view of the universe which went on to exclude the alchemical and religious views that Newton himself considered of vital importance. Newton’s broad-ranging study of the occult coupled with his profound influence on shaping modern scientific thought exemplifies the way in which freedom from ideological restrictions of any description encourages thinking with the potential to create new paradigms. Dogmatism which inhibits these paradigm shifts can be scientific as well as religious, as has become increasingly apparent in the recent developments into the study of consciousness. Graham Hancock’s TEDx talk The War on Consciousness, in which he discussed the role of ancient and sacred visionary plants and shamanism in our understanding of the mind, is a prime example of the negative impact of such scientific dogmatism. After only a short time available to the public on the TED YouTube channel the organization removed the video, claiming the presentation “contained serious factual errors that undermine TED’s commitment to good science” and accusing Hancock of “pseudoscience”. After failing to qualify these accusations with any supporting evidence and facing an intense backlash from the public, TED was forced to backtrack and retract their initial statement. The video was uploaded in an obscure location on their blog, with TED maintaining that Hancock’s views were well outside “orthodox scientific thinking”. For many, the expression “orthodox scientific thinking” lay at the heart of the decision to remove Graham Hancock’s talk from their channel – the attacks on his credibility and the petty, unprofessional accusations, unsupported by any kind of rigorous analysis of specific details which he could refute, were little more than masks to hide what was fundamentally an ideological issue. TED demonstrated that they represent precisely the kind of materialist scientific thinking which Hancock explicitly stated in his talk was incapable of dealing with the difficult questions of consciousness. A paradigm which precludes even the possibility of the experiential validity of shamanic altered states of consciousness and refuses to question the position that consciousness resides entirely in the brain inevitably greets such ideas with automatic ridicule and rejection. Yet progress is only ever made when orthodox thinking is challenged – the scientific method itself involves proposing hypotheses as explanations of phenomena not fully understood. In taking the position of the rigid skeptic in dealing with Hancock’s approach to consciousness, TED, whose slogan is “Ideas Worth Sharing”, demonstrated that conformity to established doctrines takes precedence over radical new ideas truly worth sharing. Just as the “oppressive content” of monotheistic religions should be rigorously challenged, so too should we challenge scientific materialism when it seeks to deny explorations into new avenues of inquiry which contradict its ideological position, as well as atheism when it calls for the abolition of religion and everything associated with it. But we should also recognize the positive aspects of different beliefs and integrate them in order to gain a broader understanding with the potential to surpass “conventional wisdom” (which, as history shows us, more often than not turns out to be untrue). The “Family” – Who Really Is Behind This Secret Organization?